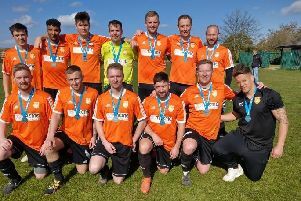 Stamford Lions Reserves have been promoted from Peterborough League Division Three despite losing their play-off match. Lions, who finished third, were beaten 4-1 by Tydd St Mary, but both teams have now been placed in Division Two. Bretton North End won the other play-off tie against Eye, but both of those teams fielded ineligible players and were removed from the competition at a disciplinary hearing last night. (May 24). Bretton won the match 5-0, but Calum Parker, Pat Dooner and Robbie Osker hadn’t played enough league games to be eligible for the play-offs. Eye also fielded Andrew Buckle who wasn’t eligible. The 2016-17 Peterborough League constitution has now been completed. AFC Stanground and Stanground Sports have merged to become AFC Stanground Sports. Division Five champions Limetree UTR have changed their name officially to Premiair. Premier Division (18 teams); AFC Stanground Sports, Crowland, Deeping Rangers Reserves, Holbeach United Reserves, ICA Sports, Ketton, Langtoft United, Leverington, Moulton Harrox, Netherton United, Peterborough Sports Reserves, Pinchbeck United, Sawtry, Stilton United, Stamford Lions, Thorney, Uppingham, Wisbech Town Reserves. Division One (16): Baston, Glinton & Northborough, King’s Cliffe, Long Sutton Athletic, Moulton Harrox Reserves, Netherton United Reserves, Oakham United Reserves, Oundle Town, Peterborough Polonia, Riverside FC, Spalding United Reserves, Stamford Bels, Sutton Bridge United, Warboys Town, Whittlesey Athletic Reserves, Wittering. Division Two (16): Crowland Town Reserves, Hampton Sport, Ketton Reserves, Langtoft United Reserves, Leverington Reserves, Netherton United A, Parkway Eagles, ICA Sports Reserves, Pinchbeck United Reserves, Ramsey Town, Spalding Town, Stamford Lions Reserves, AFC Stanground Sports Reserves, Thorney Reserves, Tydd St Mary, Whittlesey Athletic A. Division Three (16): AFC Stanground Sports A, Baston Reserves, Bretton North End, Brotherhoods, Eye Utd, Farcet United, FC Peterborough, Oundle Town Reserves, Rutland Dead Rabbots, Sawtry Reserves, Stamford Bels Res, Stilton United Reserves, Sutton Bridge United Reserves, Thoepr Wood Rangers, Uppingham Town Reserves, Whittlesey Athletic B. Division Four (16): Cardea, FC Peterborough Reserves, Feeder FC, Harrowby United Reserves, Holbeach Bank, Long Sutton Athletic Reserves, Netherton United B, Parkside, Premiair, Stamford Lions, AFC Stanground B, Tydd St Mary Reserves, Warboys Town Reserves, Whaplode Drove, Whittlesey Athletic C, Wittering Reserves. Division Five (12): AFC Orton, British School of Sports, Eunice Huntingdon, Feeder Reserves, Glinton & Northborough Reserves, Holbeach United A, Huntingdon Rovers, Leverington A, NECI Peterborough, Orton Rangers, Parkway Eagles Reserves, Wisbech Town Acorns. Veterans League (14): Bretton North End, Cottesmore Amateurs, Deeping Rangers, FC Peterborough, Glinton & Northborough, King’s Cliffe, Long Sutton Athletic, Moulton Harrox, Netherton United, Oakham United, ICA Sports, Stamford Bels, Stamford Lions, Uppingham.